The nicest part of this place is the shower, which you can see there in the picture on the left. Ooh, ahh.. looks cozy, doesn’t it? Well I like it, anyway, and I wanted to build something that would serve as a centerpiece to this future rental unit that would anchor it in the luxury market and thus allow it to earn higher rents forever. The cool part is, it didn’t really cost much to build. Those floor-to-ceiling travertine tiles, dark slate, river rock floor stones, and even the handle and valve set were all found on Craigslist at a deep discount. The shampoo nook which keeps your wife’s shaving razors from messing with your personal space is just a few extra cuts on the tile saw. And the sloped pan that allows water to run to the drain was custom made from plain old concrete and masonry mix, at a fraction of the cost of even an off-the-shelf plastic showerpan. And yet, the whole thing took only a few days of work to create from a blank plywood-and-studs slate (which in turn I made from the even blanker slate of what was formerly unused space in their carport). A fancy shower can add $10,000 or more to the value of a house in a nice area. It is also very pleasant to use even if you’re not planning to sell your house – I built a similar shower in my own house and we’ve enjoyed it very much for the past several years. But if you ask a bathroom contractor to make you one of these things, you’ll often get a quote of $5,000 or more, and as a result, most of us are stuck showering in metal bathtubs or plastic showerpans framed by old moldy white tiles. The key to this whole deal is a feature called the “poured showerpan”. It’s an elusive black-ops creation that almost nobody knows how to build in this country, which is why you see so many plastic showerpans out there. Some professional tile installers can do it, but they will charge you a fortune, and it may still not come out the way you want it. 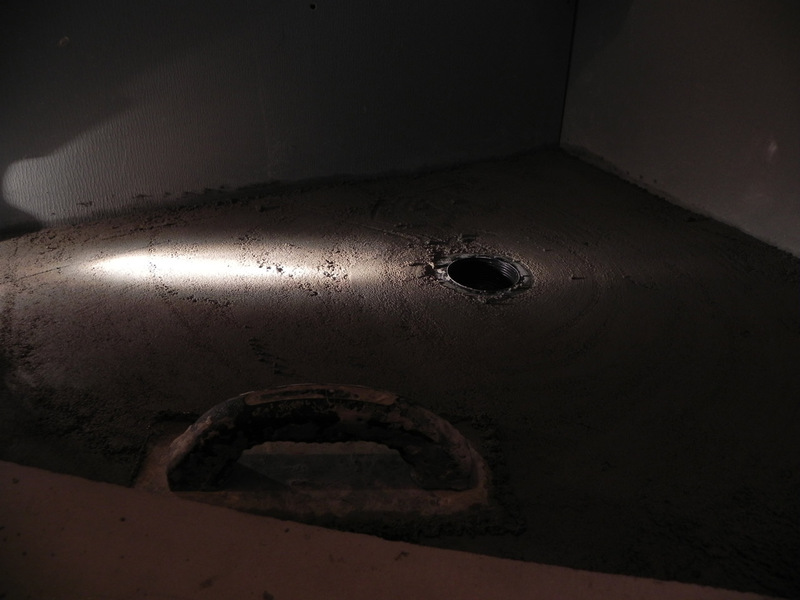 But once you unlock its secrets, you are free to build shower pans in any shape and size, at a surprisingly low cost (about 60 bucks including the drain and the waterproofing*). And today I will show you how to make one. The basic idea is this: we’re making an absolutely waterproof concrete bowl with a drain in the middle. Usually there will be a raised “curb” at the edge, and a nice tile or stone surface above the concrete. 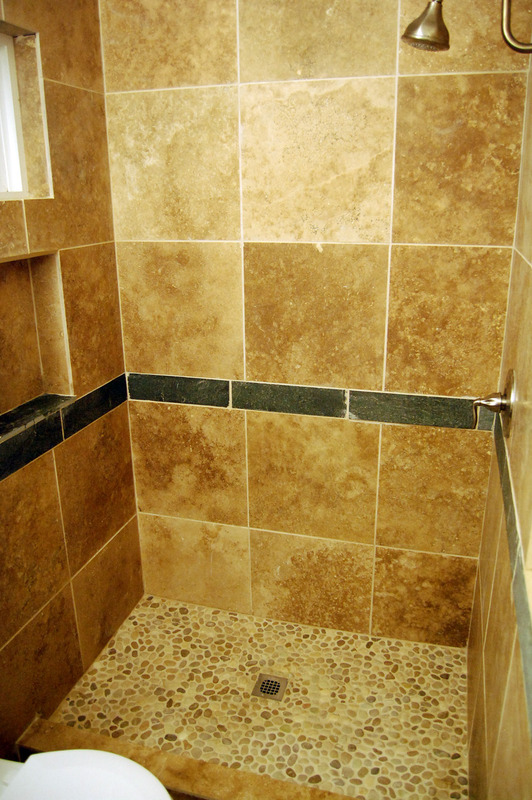 After you finish the bowl, tile it, and grout the tiles, you move on up to tile the rest of the shower walls. But it all starts with the poured showerpan. The easiest way to go about this is to make the curb first. This involves creating a wooden form and filling it with concrete. I usually make these things 5″ tall and 4″ thick, so you simply cut two 5″ boards to length, screw them to the floor and walls as needed, and be sure there is a 4″ space between them. Note that for extra strength in this case, I put some large 4″ screws into the floor at each joint, and ran some steel reinforcing wire along the length of the form’s center, to create more tensile strength (and thus crack resistance) in the finished form. This is not usually necessary, I just find it really fun to make strong concrete things. The black material at the bottom is roofing paper – just to isolate the concrete from the plywood so the moisture from the wet concrete would not wick out into the floor. A general good practice for concrete over wood. 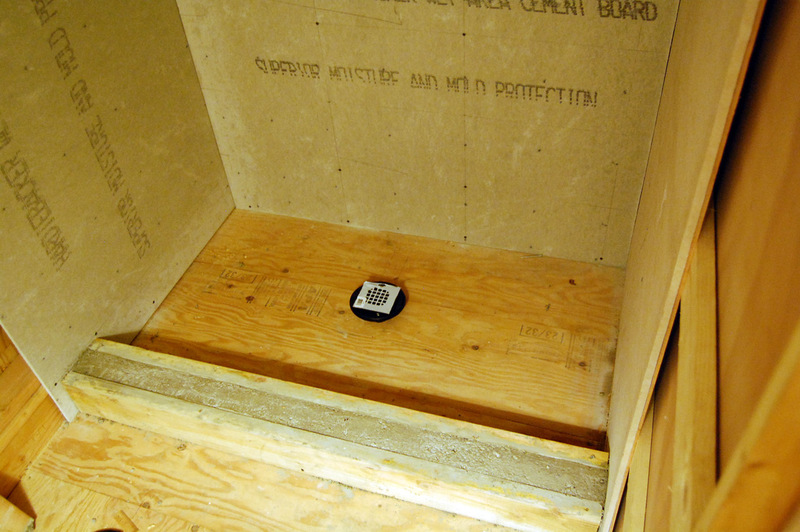 Drain is in place – top surface about 2″ above the plywood. If you’re also doing your own drain plumbing, you’ll want the drain pipe to end just about flush with the plywood floor, so that when you glue on the shower drain, it is about 2″ above the floor. Thus, when we pour the concrete at the next step, the minimum thickness will be 2″. 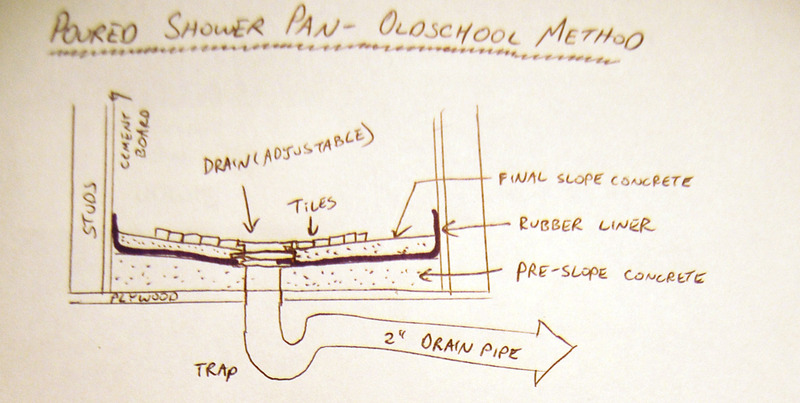 Old showerpan method – concrete, rubber, concrete, tile. Note that this method is something I more or less invented for myself by puzzling through the product’s poorly written technical documentation and trying it out. The tile installers I know still do things the old way and some might scoff at the innovation. But I’ve built at least 20 showers like this now, and I can still look at the oldest one from below and verify perfectly dry wood beneath- no leaks. It would be virtually impossible for this design not to be watertight, as long as you do tidy work. Now that you understand the basics, let’s check out a couple of action pictures to show the pouring, forming, and waterproofing in detail. 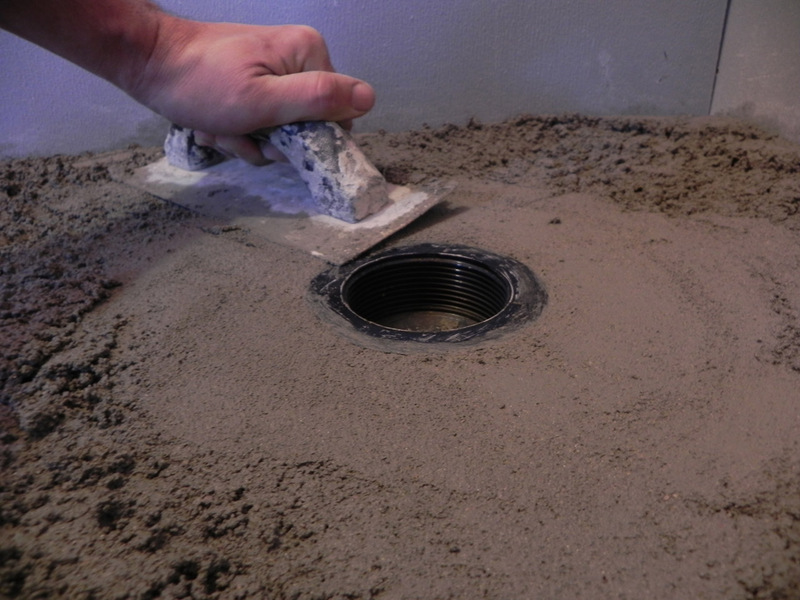 The top of your drain should be about 2″ off the floor. To create a uniform slope, use a ruler or level to draw a line all around the perimeter of the showerpan that is about 2.75″ off the floor. This will provide a nice 3/4″ slope to allow water to flow down into the drain. You’ll want a fairly dry (almost crumbly) mix of cement. 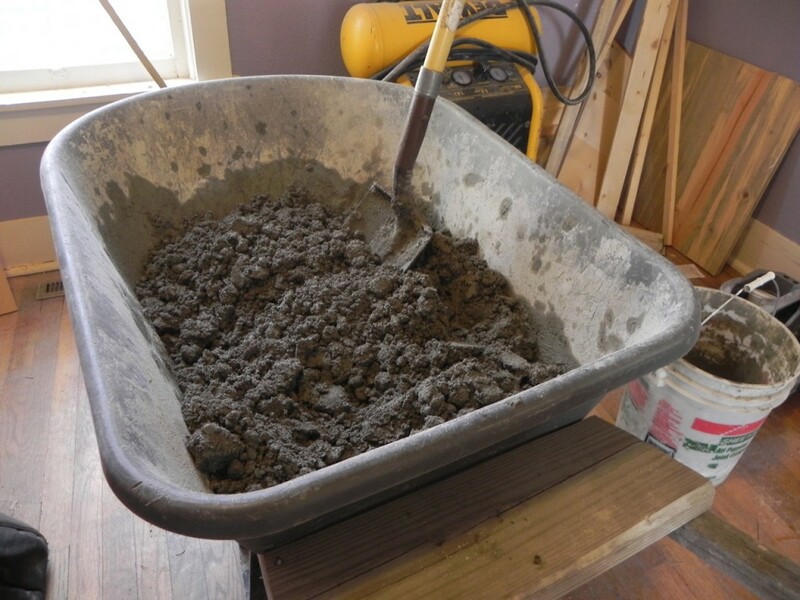 But not regular concrete with gravel aggregate in it, here we use mason’s mix, which is just portland cement and sand – the same stuff used for brick mortar. Available right next to regular bags of concrete in the store. About three 80lb (36 kg) bags will do a 32″x48″ shower. Dump it in, spread it around. Note that the drain’s removable/adjustable top is removed for this step. But cover the remaining part of the drain with tape, lest you get concrete into the trap! Here’s a completed pan, still wet. All the tools involved are shown too. After this dries, you’re back to a standard tile job: Do the floor and grout it first (for greatest waterproofing), then work your way up the walls the next day. I don’t have space left in this article to explain the entire art of tiling a shower, but perhaps I’ll have a chance to work with you in person on one of these things someday. *The 60 bucks is just for the showerpan, of course. Then you’ll add about 12 square feet of floor tile, 75 sqft of cementboard and wall tile, tile adhesive, grout, and a valve set. The total can still be only a few hundred dollars if you shop well (ours was even less, due to Craigslist). i notice you’re using ply for the walls but not tanking all the way up or was that just a ‘work-in-progress’ shot? – is that not a bit risky in case of water ingress behind the tiles. Are you tiling the walls straight on to the ply? I have a similar job re-tiling a bath/shower – was going to use cement-board (knauff aqua-panel ) to avoid the need for tanking everything – you can just tile on directly, aparently these boards stay sound even if fully submerged! I noticed the same on the wall waterproofing. It looks like he’s using cement board in the personal shower, but on the latest, it looks like particle board or plywood. I’d be concerned about waterproofing as well. Also – you realize you’ve opened yourself to a grouting/tiling 101 article request now, MMM? the personal shower looks like it could be plasterboard! but hard to tell from photo – I think you can get moisture resistant plasterboard for bathroom use but that would still need tanking for a shower area. He is using hardibacker on the latest one, which is water resistant but not waterproof. This should be fine when combined with tile and grout (remember that water is not resting/pooling on walls) but there should be a moisture barrier placed between the hardibacker and the studs. I like kerdi boards better though – true waterproofing but more expensive. Since he already started up the wall for the last foot or so he could just run the RedGuard up the wall. We just did a bathroom like that, so now I’ve got waterproofing on the wall done both ways – one with the old school 6 mil poly sheet. The sheet wasn’t going to work when I did an inset shelf in the master, so RedGuard it was – cool stuff. No water penetration that I can tell, and it’s been a month. Just curious, MMM – how much of the planning and material sourcing was done before you were on the ground there? How much more time do you think was spent finding project materials on the cheap than if you were just running to home depot? Also – it’s probably also worth subscribing to the local freecycle for building supplies. We’ve put extras on there after a project is done when it’s not worth going through the hassle of Craigslist. I love that type of shower! To know that it can be done on the cheap makes it more of a reality than I thought. The thing that scares me about concrete work is that if you mess up, you can’t fix it. Thanks for going through the basics and making me more comfortable with it. For a project like this, if you end up doing the concrete wrong you can bust it out with less than an hour of hammering with a sledgehammer or deadblow hammer. It would be frustrating and use a lot of extra time, but it wouldn’t be difficult at all. This is great. I just got through building a shower base using the old method and this is definitely easier. The only thing that I’d worry about with your method is that I don’t think it would protect against a crack in the base as well as using the old method. No membrane to back you up. Tiling is one of the best skills for a “do it yourselfer.” It isn’t hard, saves a ton of money and the results look awesome. Lots of bang for the buck. To build on that, one of the most useful tools I ever purchased was the cheapo Home Depot tile saw (http://goo.gl/HbTkt). Mine is over 10 years old and has served me well for over 30 projects. I have the older version of that saw and have easily laid 1000 sq. ft. of tile over the last 8 years a + I have loaned to 2 friends for their jobs. It was the 2nd best tiling purchase. Best tiling purchase: knee pads! I think a reinforced wire mesh may be good to add in the concrete floor. I’d assume it would prevent more cracking. I’m looking at ideas for my friend’s cabin. But my question is what climate did he use this process in? I’m in Western New York and it gets rather cold in the winter. I’d be concerned in a summer only place with the heat turned off in the winter, the cement may contract and expand causing cracking in the floor and lip. Great looking shower! I literally just finished one in our rental and it looks great. Even with using the cheap tile that Lowes sells. Throw a nice little mosaic strip and bam, looks awesome. I just built my first shower pan too, mostly because I didn’t want to pay the $100+ price tag for prefab crap. It was pretty easy actually. One thing I’ve got a question on though is waterproofing the walls. I went ahead and used a membrane on the floor and up the walls. By going with the concrete board are there no worries behind the tile? IMO, the best option here is to continue the Redguard all the way up the walls (exactly as recommended by the manufacturer). 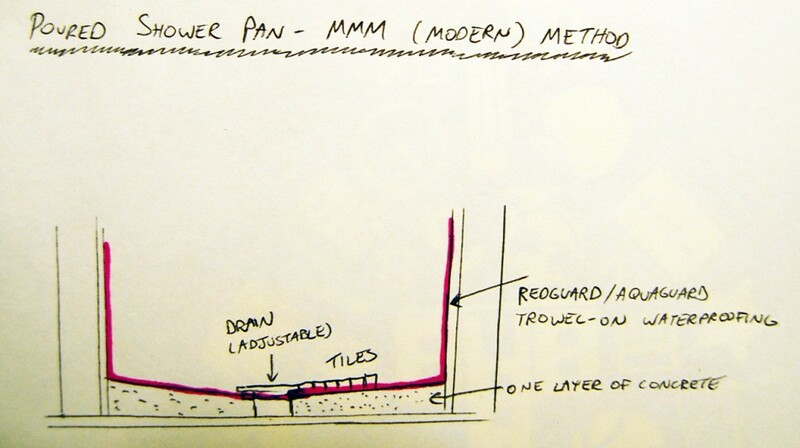 I love this method of waterproofing the pan, but I don’t understand why you wouldn’t continue with the walls. Timely article! My wife and I are probably going to make a custom shower in our house this week. I was going to limit myself to standard sized plastic shower pans, but maybe I’ll reconsider. Thanks! What are your thoughts on the rigid foam sloped trays? I’ve seen these be used to create the slope. Any big positives/negatives to using one? This is awesome! I’m kind of handy and have laid a few tile floors, hopefully I can take it to the next level and build something like this to replace our moldy plastic shower basin. Just found your site a few days ago. Oh what i’ve been missing! In our last house I paid someone a lot of money to put in a nice shower like this and he used a “kerdi” drain system? (Some german shower kit?) is something like that necessary to prevent leakage? Awesome job. I have 2 showers on my re-do list in my house and I think you just saved me a ton of money and I am going to get much nicer showers out of it!! This blog post is getting an immediate bookmark! I did a very similar tile shower in my basement 2 years ago. The whole thing cost less than $400 total in materials and it is the nicest shower in our house. Can’t wait to do an oversized one in our master. I used the old method for the sloped base, I’m excited to try out Redguard or Aquaguard instead, thanks for the tip. Really awesome. Well done. I’ve got some “make stuff with my hands” goals for the new year, but this is probably a little overly ambitious for me. I’ll need to start with a bench or office table before even contemplating a shower. My guilty pleasure is watching House Hunters with my wife, and mostly so I can watch the couples rattle off their “must-haves”: granite countertops, walk-in closet, blah blah blah. You’d think these people were buying an outfit at Nordstrom’s, not a freaking abode. So it’s not surprising to hear you say that a nice shower can up your home’s value $10k. It’s mind-blowing, but awesome if you’re on the receiving end. Not to mention stainless appliances. How could you ever cook anything without professional grade stainless appliances? I have actually seen a woman who admittedly doesn’t cook but needs granite countertops in her kitchen on that show. My wife and I watch it for the same reasons you do. Quartz is the way to go, anyway. Property Brothers is one of our favorite shows. Very nice. I just completed the concrete pan on my own shower. Used wood instead of cement for the curb, but otherwise very similar. You gave me a great idea on the ledge instead of buying some expensive soap holder tile piece. Any idea about glass? My shower is a corner that is tiled on two walls and glass on the other two. It will have to be custom glass because the door is actually at an angle, so the glass will be three sides with the door cutting off the corner. The easiest/cheapest soap holder I’ve seen is to cut a tile in half diagonally, then set that triangle in a corner at whatever height you want – or use both triangles for two soap shelves. Extra luxury! If you tip the tile back slightly to avoid soap slipping off, just clip the back corner as a drain hole. ooh, i like that idea! clever! When you did your curb with wood only, did you just waterproof it with the redguard? did you use any other materials to water proof or secure it? I currently have a square tiny corner shower that I am trying to make feel a bit bigger by making a hexagonal (neoangle shower) that will allow the door to open to the center of the room rather than into the sink counter. If you have any tips for this shape shower please let me know. Also did you get prefabbed glass doors for it or did you have them custom made? Are you going to do a glass door or just use a shower curtain? I like the look of glass but have had a terrible time keeping it “clean” or keeping the calcium deposits off of it in every house I have had glass before? Assuming you are going with glass for the luxury feel? Nice post – this is info I can really use! I find that you just need to use a good grout sealer right when you’re building it (put in grout, let it cure for as long as you can stand to wait, seal). Or after you do a thorough cleaning and let it dry. My own shower in Colorado only needs cleaning every few months, because of the sealed grout, plus it dries quickly after use, and the dry air there causes fast evaporation. Then it is easy to clean with a scrub brush when the time comes. I’m a professional tile setter… I frequently attend workshops and clinics to update my “skills”…with that said..please please please..STOP saying sealers “seal”.. they DO NOT make grout waterproof. Modified grout has polymers (like latex) to offset moisture, urethane additives are better, epoxy is the best.. each of these is harder to install respectively. In fact, water will get through grout and therefore the final drain assembly must have been installed properly. Invest in a squeegee (window wiper) that you can hang in your shower. After every shower, wipe the tile down to get most of the water off. Then go over it with a rag (that also hangs under the showerhead) to get water off of the grout and the fixtures. It takes a minute or two after every shower (or only for the second shower of the morning), but you never have to clean or scrub or use cleaning products on your tile–and no water spots either. You can also wipe down the curtain with a little practice and do the tub or pan as well. Mold resistant is epoxy grout. To save money buy epoxy grout and sanded grout from Laticrete same color. Use epoxy for shower rest sanded grout. I just recently learned how to and did this myself. I think your ‘old way’ diagram is wrong, the liner goes behind the cement board, and a 6 mil sheet of plastic is behind the cement board because it is still permeable enough that water will wick through it. I put shower nooks in as well when I did the bathrooms in my house and it’s all anyone talks about when they use it. Fantastic MMM. Very clear. And it’s information that I truly appreciate. I’ve always loved construction and have gotten many a book from the library to learn about building houses. As I mentioned just yesterday on another blog, my dream is to build 300-600 square foot units. If they could be built at $75-$100/square foot, so many people would be able to afford housing, without having an albatross. BTW, looks like you helped someone with a financial investment, and you’ve gained a friend for life. I like those opportunity fringe benefits. Beautiful! Are there two nooks or is the upper one a window? The top one is a window, although it does work as an extra shelf. Old school method is okay, but Ditra is the way to go today (…and no, I’m not trying to plug the product). All other methods will fail, it’s just a matter of time. Ditra is designed on the theory that a grout joint will ultimately fail and allow a very small amount of water through the joint and back to the drain. Ditra also decouples the tile from the substrate preventing movement (cracks) of the grout joints as the substrate moves (and it will ever so slightly). Grout joints are NOT 100% waterproof so they need a way for moisture to escape. Moisture failure can take a number of years before it appears. Reference a good tile book, “Tile Your World” by John Bridge. Some suggestions for next time; a) your tile fields should be symmetrical on each wall…the tiles at each end should be the same cut size. b) the floor drain should be in the center. These things are obvious details that are easily noticed by the more experienced (gray mustache) weekend warriors like myself. Otherwise, glad to see you didn’t use a fiberglass pan or walls…and good workmanship! Note that the redguard-under-tiles method is also designed to allow any water that gets through the grout, to seep into the drain. As for “everything will fail in a matter of time” – I’m not so sure about that. Solid reinforced concrete with a layer of plastic waterproofing under grouted stones? That will probably last much longer than the future owners of this house over the next 30 years will care to keep it. Things get remodeled periodically and often the fashion dies before the waterproofing. For example, when I tore out the 1978 showers in my first house, it was just cheap builder tile over plain paper drywall. No waterproofing or cement board in sight. Still held out for 30 years, even though it was hideous to behold. I rebuilt a 1950s “luxury” shower a few years ago and its old sloped concrete pan was still going strong. I’ll 2nd the recommendation for John Bridge’s book. Even better info can be had at the John Bridge forums online. Redgard is a fine product for some situations. We used it in our current tub surround around the CBU joints around a window. For those that worry about using a liquid, it’s easy to do, and is very obvious if you don’t get a good coating anywhere. But MMM, not putting something behind the CBU or plywood on the walls is a mistake, I think. Sure sometimes it’s fine. (Your reference to drywall behind tile from 1978, etc.) I’ve seen soaked drywall behind tile walls several times in my limited experience. One I can think of was probably less than 15 years old. I wonder if it often works in your area of CO due to local conditions (Quick evaporation like you mentioned), but doesn’t work so well in other places? (Like Hawaii?) Go on John Bridge’s forums and check out the info there. You’ll see stories of rotted framing and drywall behind tile walls. Rotted framing even behind CBU. It’s not waterPROOF stuff. Tile itself can be porous, grout isn’t a complete water barrier, nor is cement board. So often a good idea to have a waterproof layer in there somewhere. Like poly behind the CBU or something similar. Word. I just gutted my 50 year old bathroom because I finally had enough of the tourquoise. The builder grade tile directly on paper thin ply and drywall held up *surprisingly* well. I realize this is non sequitor but could you reintroduce the MMM challenges? Maybe in the new year since people are probably trying to get their finances in order. Looks lovely. Two questions — one, it sounds like you’re installing this over a slab (I’m assuming a slab floor in a former carport); what if any are the implications of the weight of the concrete in other contexts? Two, I’m hoping any future remodels I’m involved with will employ the principles of accessible design, which would lean toward no curb. Does that in any way complicate matters? Other than perhaps a longer run and steeper slope (and/or perhaps a drain positioned toward the back rather than the middle), I’m assuming not, but maybe I’m missing something. Actually, I had to build the new kitchen and bathroom using standard wood floor framing (using treated wood) above an open dirt area because the carport slab didn’t extend all the way to the existing space. And the new space is 6″ higher than carport. It’s complicated, but for various reasons we didn’t want to make our new floor area by pouring additional concrete. Anyway, there are no worries about the weight of a showerpan – this one is only about 250 pounds. Even with the extra few hundred of the surround tiles and backerboard, it is well within the range of what a standard floor can support. As long as you aren’t building a 100SF shower or something really unusual. In really old houses, which were sometimes made with 2×6 floor joists and no subfloor, the story might be different and you might want to reinforce before adding heavy things. Happy Christmas to Mr MMM and family. Enjoy your vacation. I look forward to another year of thought provoking and helpful posts on FI in 2013. From Sara in a wet but mild Wales,UK. Eerily timely post; we are buying a house built in 1949 and when we did the home inspection today, I found a crazy quilt of leaking cast iron, PVC and copper piping under the house. So.. I’m going to dive into the bathroom remodeling job that I hoped to put off. I read your earlier post about PEX and I’m now getting excited about ripping the whole mess out and redoing it. Since the house currently has only a single bathroom, I’m considering adding a half bath as well. Any tips on joining a new PVC drain system to the old cast iron? Using one of those rubber couplers just looks incredibly cheesy to me. I think the rubber boots with built-in metal clamps (and a stainless steel corrugated reinforcing sleeve) are the way to go. I think they look pretty nice – and you only need one in theory, where you join the final drain from your whole house, into the output to the street.. if you re-do everything else, that is. Tip: look into permissibility of “studor vents” in your area to prevent a bunch of unnecessary holes in your roof. Those are interesting.. I had never heard of them. Just did some Googling. I will keep it in mind, at least for the half bath addition if that becomes part of the plan. Thanks for the advice! This looks great but i fear it is out of touch for someone who is as unhandy as me – I don’t even understand how you built the form – I don’t see the screws you mention. My husband shares my lack of skill. We just had to have someone reinstall 2 windows we tried to do ourselves. We aren’t dumb, we’ve just never been exposed to doing this type of thng. seems overwhelming! maybe we will have to just go with the shower tray thing. I know this is hella late but I know how you feel. Look into low cost and free homeowner workshops in your area. Where I live, several nonprofits offer tutorials on light wiring and light plumbing as well as things like laying flooring, repairing cabinets, etc. I find I learn better hands on and it gives me an opportunity to practice a bit with the tools and a starting point for evaluating the many (often conflicting) tutorials on the web. I just installed a mat for heated flooring and tiled over it and textured the bathroom wall…..very first ever project like that and I survived. Lol. Also, some areas may have a tool library where you can borrow tools…..doesn’t hurt to look because the cost of tools can add up. With your new method, how do you deal with the small amount of water that makes it through the tile/grout to the barrier? Do you still use a drain that has weep spots so it doesn’t just pool near the drain under the tiles? Do you just inset the drain lower than the tile and even with the barrier? If you go to the plumbing section and look at an adjustable-height shower drain, you’ll see how it works. The key to this method is the 2-piece drain. The lower part gets embedded into the concrete, perfectly flush (see my second sketch). Then when that hardens, you Redguard all over everything, right over the edge of the lower part of the shower drain. Then you screw in the drain top, tile and grout everything flush with the top of the upper section, and seal it. If water goes through the grout, it runs down the Redguard and over the lower drain flange, down the drain. I hope that will make sense in the context of looking at an adjustable-height drain..
Great blog, I’m in the process of gutting a bath at our place. In terms of the adjustable drain, all I can find at the local stores is a three piece setup with the base, a screw down collar normally used to seal down the liner to the base, and the adjustable drain. Using your method do you just not use the collar piece to allow any water that gets through the tile or grout to drain down the weep holes? I assume this is the case but just want to be sure. Here is a link to the common type of dain I seem to find at the local hardware store. http://www.showerbase.com/store/42202. Ever figure this out? I am in the same spot. I guess I could do the divot method, but I want to try to copy the uber-simple MMM method. Yeah, with those 3-piece dealies you can discard the middle section with the bolts (since there is no rubber that needs clamping in this case). So you just have the bottom with threads, and the top part with the drain grille that threads into it. 1) The typical shower pan/tile drain is a three piece, with weep holes. And, if you eliminate the middle bolted-on section, there will be no threads to screw on the top/grate (the threads are on/in the middle screwed/bolted section). There is how-to’s regarding a divot method and these drains, but I was hoping to use your exact method…and drain. 2) There are also some specialty drains by Schluter/Kerdi and Laticrete which are made to be used with liquid membrane, i.e. Redgard. But these are very pricey ($100+ for just the drain). I have had that question before, so I definitely need to add more detail to the article. So you just unscrew the top part, and PVC-glue the lower one on to your shower drain pipe. Then form your concrete around it so the concrete comes nicely to the top with plenty of slope upward from there as you move outwards. Then let that concrete cure, and add your Redguard, over all the concrete and extending right over the edge of the plastic. Then screw on the drain lid to the lowest position (or whatever matches your tiles). Tile around it. I do similar way with few diferences:1. The key of prevention of crax is to enforce framing. In shower area put extra 2x4s sideway to existingn use construction glue and decking screws. Before I do this I put extra pieces of 3×4 to bottom and top of 2x4s and screw them to bottom and side of 2×4.after I put sideway 2×4 I put extra crossmembers 2×4 or 2×6. Reasons? 2x4s twists. And ya get extra support for cement board. 2. Ya need to put something on the bottom plywood and wertical wood to prevent direct connections concrete-wood. Floor oil paint is fine, 6 mil plastic run from behind cement board on the floor plywood is great. 3. Reinforce concrete with rebars and mesh. Put mortar additive to concrete and very top layer of concrete put some layer of mortar.while concrete is still wet to tight em together. 4.I dont put drain into center. This allow me do one way slope with large tiles whhat is best waterproofing- minimize grout. Am little bit progresive so I use linear shower drain. I make it home since they are expensive from plastic and fiberglass. Copy Laticrete linear drain because has flashings. Others are not so good in my view. If you know welder yo can make from anticorosive tubing as the best. Yes, do not even look at expensive stuff membranes as Schulter etc. Ya not build water tank. There is no pressure on walls. Ye have 90 degrees vertcal walls which ain’t hold no water. Moustage man is doing my way. 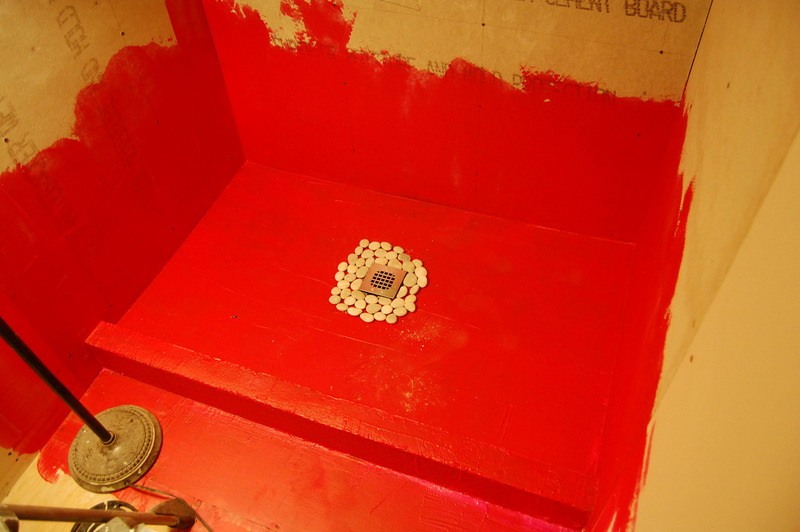 I buy one galon waterproofing membrane, in this case Red Guard, and use it for floor and lftover on walls. One big + for Moustage man is that he puts cementboard into concrete. Overlaping- something how masons lay brix- is key of crax prevention. MMM, I had a couple of follow-up questions after reading this article 3 times over, as I’ve never poured concrete or tiled, but feel confident that I can give it a go! 1) Regarding a straight, single-threshold shower, is it necessary to pour a concrete curb? Could you instead just frame it out with wood, face it with your hardi-backer, and redguard it with the poured sloped shower base? Why or why not? 2) When you pour the curb, how long do you let it cure before pouring in the sloped pan? Hell, how long do you let it cure before removing the form? 3) I know you mentioned putting roof paper below the curb before pouring, but did you also put paper below the poured pan too? It looks that way from the pictures, but wasn’t mentioned. How did you attach it to the plywood sub-floor (tape, glue)? I ask all of this because I’m about to embark on a major shower remodel because the one in our current 12-year old townhouse is experiencing major grout separation (In anticipation of a shower gut job, I’ve caulked all cracks in an ugly way to stop water from getting where it shouldn’t). This particular shower is on the 3rd floor of our townhouse, so I don’t know if it’s the settling of the building causing this or what – the major gaps are happening on the tile that’s on the party wall only, not the walls that run perpendicular to the party wall). Do you think red-guard help to protect against this? Or is this the result of crappy builder-grade git-er-done tile work? Since my house might be prone to this, should I consider running the heavy grade vapor barrier up the wall before pouring concrete and troweling on the Redguard? Any answers and/or advice are enthusiastically appreciated. 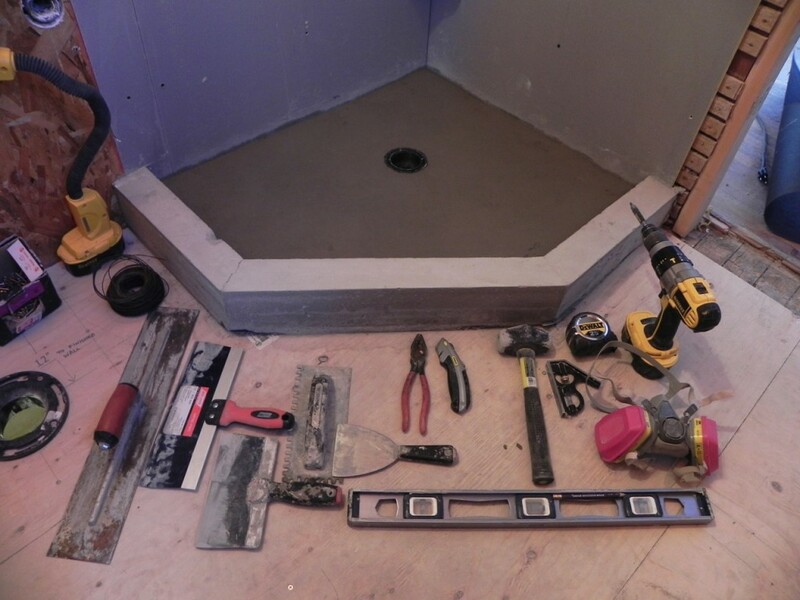 I have read and viewed several DIY shower pan projects that say you should use Deck Mud rather than Wet Cement not only for its strength but so that if/when water permeates through the grout it will easily pass through the sand mix mortar base onto the shower liner and through the drain weep holes. Otherwise the water will “pond” beneath the tiles and produce mold and mildew. Is there any truth to this and if so isn’t your new method creating a petri dish for mold and mildew to form beneath the tile? Redguard specifies that the concrete should be fully cured before application. Is there a reason you ignored this? Good point! The longer you wait, the better adherence you’ll get with Redguard, and standard concrete takes up to 28 days to cure fully. I do try to wait as long as possible given the project schedule, and the curing happens in a decaying exponential pattern – fastest during the initial time, then trailing off over time. So the difference between day 1 and 2 is much larger than the difference between day 10 and 11, or 27 and 28. Curing also happens faster in high temperature. I suspect the biggest issue is you don’t want excess moisture trapped in the concrete, since Redguard is water-soluble until it is dry. But there could be other reasons they put that in the directions (anyone?). Anyway, something to be aware of for more meticulous readers – thanks Dirk. I am thinking of forming a shower pan under a claw foot style tub. How could I strengthen the areas where the feet would sit to minimize stress cracking? Also the existing floor is tiled with marble 12-inch tiles — could the concrete be applied directly onto this or would adhesion be a possible issue? I am very late to this party. Thank you for this excellent article. I have long-wanted to do a poured shower pan. I can’t really tell what kind of drain you’re using, other than adjustable. Given your approach, it would appear the drain intended for a pre-fab shower pan is the ticket, versus the tile-in variety with weep holes. Is that correct? 8 or 9 years ago I tackled my first tiled shower project, with only one countertop tile project under my belt, by making extensive use of “Tile Your World” by John Bridge, and the web forum. The book explains everything very well. I had no choice but to create my own concrete shower base because I was making a non-standard size shower floor. I was scared and nervous about tackling this project by myself, but the shower turned out beautiful, and I have had no problems with it. This waterproof coating idea is very interesting, and I will definitely consider using it on my next shower project. This is such a great method. I am in the final days of competing my shower remodel and your method was the one of choice. I was working with very limited head space, so the use of one layer of cement was ideal. 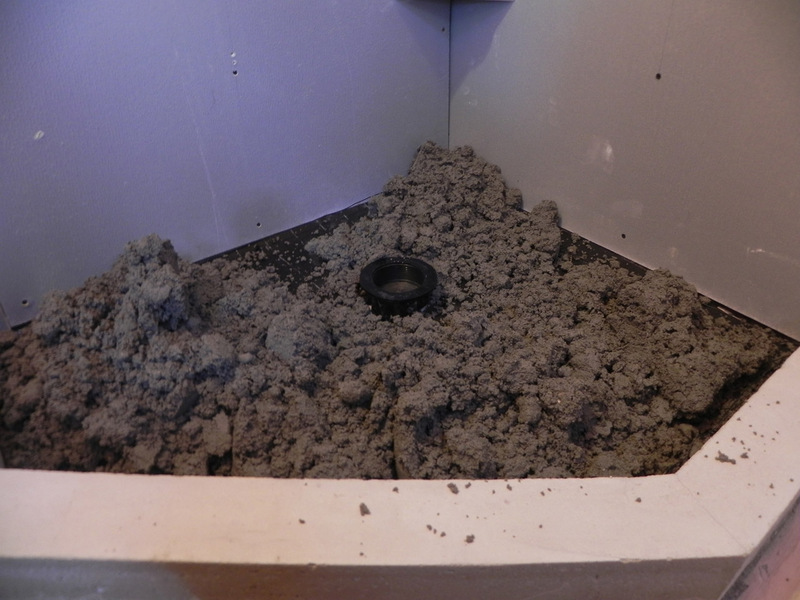 My only modification was to use the existing drain – this meant it was flush with the plywood subfloor. I poured my pan in the same matter, but left in the adjustable drain during the pour. When everything was smoothed, I removed the drain and hand sloped the cement at the edge. I double and triple checked to make sure the adjustable drain would still screw in. All in all, I had a beautiful custom shower pan ready for Redgard. Thanks MMM! I like this idea. I am going to try it. I didn’t quite understand the drain assy part especially when tiling. do you silicone the drain ring down to the tiles? Nope.. you basically screw in the adjustable drain, right down to its lowest position.. then tile right around it, and of course grout everything once the tile adhesive is set. I’m about to build another shower like this (the biggest one by far), so we will take some more detailed pictures and update the article. Did this article ever get updated like you mention? – I know that caulk (as opposed to grout) is used between tiles at a change of plane, but I’m specifically interested in what is used between cement fiber board between changes of plane, especially the horizontal edge between the concrete shower pan and the bottom row of cement fiber board. How should this joint detail come together? I was planning on pouring the pan first and then hanging the cement fiber board. 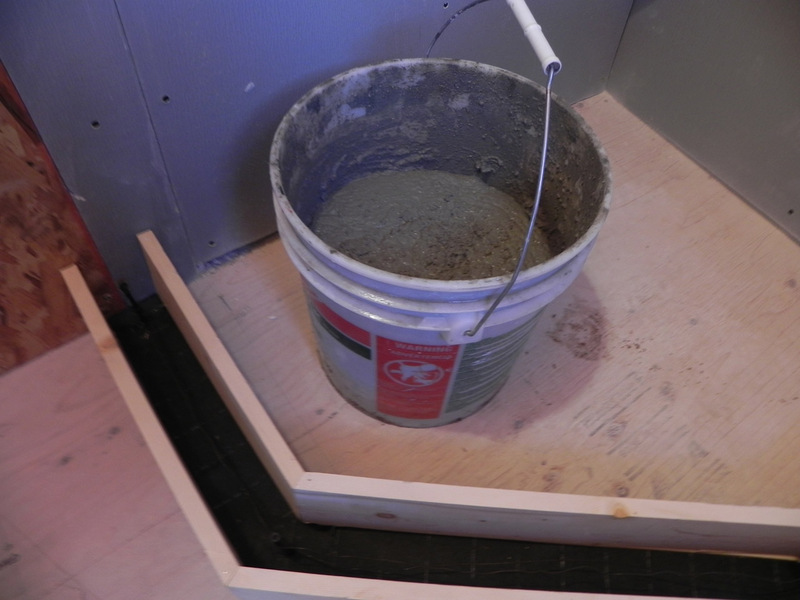 I would be leaving a 1/4″ gap between the bottom of the fiberboard and the top of concrete. I would put a bead of caulk between the gap so that the Redgard would be able to make a solid transition from pan to wall. Does this sound problematic at all? I am in the process today of demolishing an old school shower built this way — concrete pan, rubbery/vinyl looking liner, tiles, etc. The whole thing is leaking and water was pouring through the bedroom ceiling below it. It was a “luxury shower” built almost 20 years ago, but it didn’t even experience 20 years of constant use. I can’t justify building another one of these things and having another flooding issue 10 years down the road. So fiberglass liners look like better options. And demoing this shower has been an awful experience too — not at all easy like it looks on Youtube videos or HGTV. total nightmare. Im wondering what type drain you used here.. Im about to do a shower this way and from what I can tell about the drain I have, just a home depot drain, I wont be able to screw the drain down enough to meet the tile. Meaning after I put in the drain housing and add the deck mud up to it. once I screw in the bolts and flang then screw in the drain itself in, it sticks up about 1 inch. any help would be great. Well, we made the curb a week ago. Poured the pan bed this morning. In one month, I’ll paint the whole bathroom with that red stuff and take a class on tiling. I’ve got to thank you for this. My plan was to rebuild a 100 year old burnout; retail store downstairs, loft upstairs. I didn’t originally intend to build it by hand. After all, I also run a store and am a 50+ year old woman. Well, soda-blasting the fire damage; dealing with efflorescence; hanging studs; laying, sanding, whitewashing, and sealing locally milled pine flooring; and now tackling the shower, I feel like I can do anything (- except the mechanicals. I helped pull the wire, but it’s just smart hiring pros.) Thank you again for helping out with a major step. Wow, right on Kerry! A very inspirational tale, and it sounds like a great project. Where you get the soda blasting medium for cleaning off old bricks? I have a small compressor-mounted sandblaster unit and I’ve been shopping for that stuff for a while and can’t find any locally. Thank you very much for sharing your method. One thing I am a bit confused on is the curb. You mention you isolate the contretemps from the plywood with the roofing paper. How then, does the curb stick to the floor? I assume I can’t have a curb floating on paper and then tile it? Hope to learn! I’m thinking I need a mortar bed to support the wooden deck-like structure but I’m not sure if it will be strong enough. Wondering if this red stuff will hold up to the wood as well as it would tile. Is the curb mason’s mix as well or some other form of concrete?